Panama’s Azuero Peninsula is one of the most endangered ecosystems in South America. ©Andrea Egan/UNDP SGP Panama. Mr. Dolores Solís, a farmer in Los Asientos, Panama, is part of an organisation that is transforming the Panamanian ranching sector by promoting the use of stainable practices. Although small in territory, Panama is a country of immense natural wealth: great biodiversity, abundant water resources, rich soil, and huge tracts of tropical forests. However, these vital natural resources require careful management and use in order to prevent environmental degradation. Treasured as Panama's cultural heart and soul, the Azuero Peninsula is a farming and ranching hub, and the largest cattle-producing region in the country. The rolling hills of the peninsula are matched by an inviting coastline. Over time, the peninsula has seen dramatic transformations – from verdant rainforest to cattle country, from sleepy backwater to one of Panama’s most popular travel destinations. In the Azuero Peninsula, a tropical dry forest – one of the most endangered ecosystems in the South American biogeographic region - the negative consequences of extensive conventional cattle ranching are evident. Deforestation and soil degradation have further impaired ecosystem services, such as clean water and soil nutrition, necessary to support ranching and agricultural livelihoods. In addition, the extreme rainfall and drought associated with climate change further compound the stresses of unsustainable land use practices, and make restoring the ecosystem particularly challenging. Nevertheless, advances in forest restoration and farming systems have enhanced the production and provision of ecosystem services in cattle ranching landscapes. In particular, the establishment of silvopastoral systems has been beneficial for the region. Silvopastoral farming, now also known as agroforestry, is the practice of combining woodlands and pastures symbiotically. Perhaps the oldest agroforestry system used in the temperate regions of the world, silvopastoral systems are characterised by integrating trees with forage and livestock production. Such systems have the potential to increase agriultural production in the long term. Silvopastoral systems promote mosaic land use by integrating trees, forage shrubs, and livestock production. This mix of different activities, including planting trees and shrubs around crop and livestock harvesting, provide the necessary goods for local needs, while alleviating pressure on natural forests. However, until now these practices were virtually absent from and forgotten in the Panamanian landscape, mostly due to a lack of information and incentives available to cattle ranchers. To address this issue, with the support of the GEF Small Grants Programme (SGP) - implemented by UNDP, the Association of Livestock and Agro-Silvopastoral Producers of Pedasi (APASPE) received a grant to contribute to the management of productive landscapes in Los Santos through the establishment, expansion, and improvement of sustainable livestock raising and agricultural systems. Created in 2011, APASPE is a local organization of environmental leaders dedicated to transforming the Panamanian ranching sector through the use of sustainable practices. Under the project, APASPE members were able to introduce important technical changes in livestock production, including silvopastoral farming. The objective of the project was to strengthen the planning capabilities of farms, establish silvopastoral systems in various forms, protect wetlands, train producers, and establish family gardens with a focus on sustainability to strengthen the food security of the local communities. APAPSE farmers are located in the Province of Los Santos in the Azuero Peninsula, in the small town of Los Asientos, an area with critical watersheds. The region was selected to create model farms that demonstrate a range of land restoration practices. The owners of these farms integrate diverse forest cover while maintaining pastures, including the use of living fences, natural regeneration of trees, restoration of river banks and wetlands, and intensive silvopastoral systems. The owners shared their experience of transforming conventional cattle ranches into a silvopastoral system, and the resulting improvement in water and land management and increased farm production. Participating farmers found that their production increased and became more sustainable when the land offers a healthy diet for animals, nurtures a diversity of organisms native to the area, minimises carbon footprint, and provides a fair quality of life for workers. An important lesson for farmers was the understanding that conservation is not limited to wilderness and protected areas. Silvopastoral systems, with its marriage of pastures with shrubs and trees as well as herbage, are normally more productive than pasture alone. Mr. Dolores Solís is a participating farmer in Los Asientos, Panama. As the 11th of 17 children in his family, he has a knack for harmonious integration, and extends this principle to the cows, coffee, sugarcane, and plantains on his plot of land. ‘Does this work? Does this make me happy? Watch my face’, and then broke into a smile. ‘This type of farming means more water, more food, more products to sell. It has many advantages. It is better - more utility. We demonstrate that it’s better for everyone...You plant corn and beans with the trees and use them until the tree is big enough’. ‘Cows are healthier because the water is cleaner and now they can go where they want, where they need, where the food is. I can put the water wherever they need. In the end the benefits are evident’. 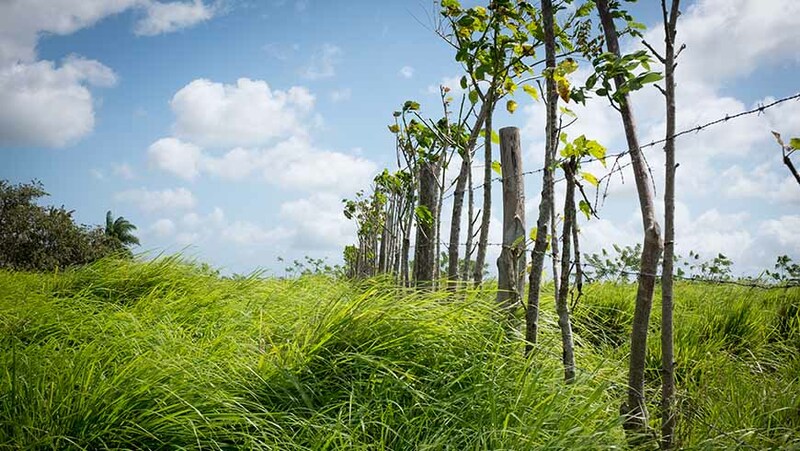 As a result, more than 40 hectares of intensive silvopastoral systems were established, including 25 hectares covered with native trees, of which 7 hectares were reforested. It also includes 38 family productive gardens, including one for Mr. Solís, one for the local school, and one each for the other 36 members of APASPE. In 2016 and 2017, in partnership with the Environmental Leadership & Training Initiative (ELTI), APAPSE conducted workshops on Ecological Restoration Strategies for Cattle Ranching Landscapes of the Azuero Peninsula, thereby effectively disseminating their knowledge and experiences to other decision-makers by facilitating farmer-to-farmer exchanges on model farms. A remarkable consequence of the use of silvopastoral systems is the increase in biodiversity when compared with pasture-only systems. The presence of shrubs and trees greatly increases cover for wild birds, mammals and reptiles. The greater range of plants and soil fertility also increases the number of insects and invertebrates that are beneficial for farming. The majority of Los Santos farmers accentuate silvopastoralism with production of food crops such as corn, plantains and bananas, and yucca. Farmers such as Mr. Solis accentuates silvopastoralism with production of food crops such as corn, plantains, bananas, and yucca. ©Andrea Egan/UNDP SGP Panama. Although sources of water are critical for ranchers, they are often degraded due to deforestation and open riparian access to cattle. With support from the project, ranchers now have access to two different cattle aqueducts, reserve tanks, and solar-powered pumps to provide clean water. Water delivery systems are a crucial alternative to cattle freely utilising riparian areas as a source of water. As such, these systems help conserve gallery forests and water sources, as well as facilitate the parcelling out of pastures for more productive intensive rotational systems. or Mr. Solís his water pumps let him alternate where his animals graze and use his land more thoughtfully. He proudly shows how the pump work and marvels at how far the water can travel. SGP provides financial and technical support to civil society and community driven initiatives that protect and conserve natural resources while improving the quality of life of the communities. Since 2006, the Small Grants Program has supported more than 170 projects in Panama. For more information on SGP-supported projects in Panama, visit the SGP Panama Country Page. For more information on this specific project, please visit the SGP project profile: Establishment of cattle ranching sustainable systems in Los Asientos, Province of Los Santos.